A sauna is typically an enclosed room that heated to between 70 degree Celsius to 100 degree Celsius, and it is well-capable of raising the skin temperature to roughly 40 degree Celsius. Many studies showed benefits and saunas effect on weight loss. Using a sauna can be beneficial if you are planning to promote your health and well-being, lower your blood presure and more. There isn't a shortage of people who swear by the advantages of using a sauna. There are four different types of saunas, and they are differ by how the rooms are heated. For instance, wood burning saunas use wood to heat the sauna rocks and sauna room. An electrically-heated sauna, as its name suggests, has an electrical heater installed on the floor to provide heat to the room. Compared to tradional saunas, infrared saunas boasts of special lamps that emit light waves. And, the steam in the steam rooms generated by one of two ways—electricity or gas; the steam generators are either powered by electricity or gas. Is it possible to lose weight in a sauna, and, if so, how long does it take? Yes, it is possible to lose weight in a sauna. If you want to get rid of one pound, you need to burn around 3500 calories. Therefore, if you want to burn a total of five pounds, you will need to burn a total of 17,500 calories. For best results, you should open up your body to as much of the heat as possible, even if it means to strip naked in the sauna room. 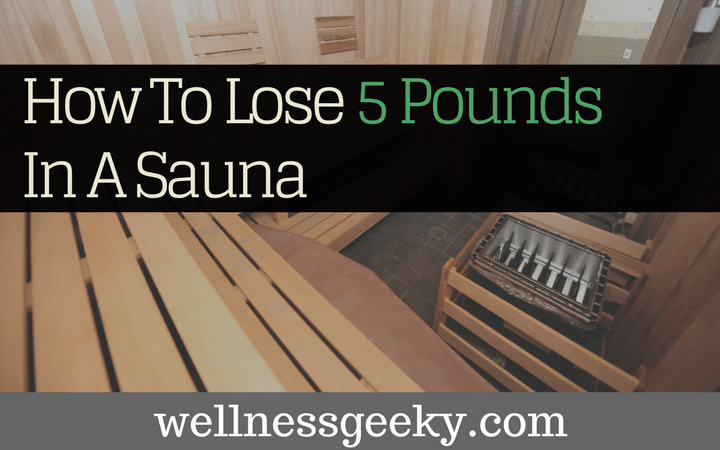 So, how does sauna help one lose weight exactly? What is saunas effect on weight loss? You sweat a lot when you are in the sauna room. Therefore, you lose a lot of water weight after a sauna session. You can quickly notice a change in your weight before and after a sauna session. However, the lost weight is gained rapidly back as soon as you eat or drink something. If you are an athlete and need to make weight, a visit to the sauna room can be beneficial. Fortunately, regular visits to the sauna room can have lasting benefits too. You increase your body heat when you visit the sauna room. And, the sudden increase in body heat can help you burn extra calories. The heat will prompt your body to increase its metabolic rate by up to 25 percent. This sudden jolt to your metabolism will help you burn several calories for several hours even after your session in the sauna is long over. Since the rise in temperature forces your heart to beat faster, your body will need to burn more calories for energy. In addition to using the sauna for cutting weight, many people use saunas for detoxification purposes too. Sweat is mostly composed of lymphatic fluid. Hence, when you sweat, the toxins in the lymphatic system are also removed. And, experts state that the removal of toxins, such as heavy metals, helps a person burn fat more efficiently. When these toxins removed, they no longer hinder your metabolism. You should don a bathing suit or cover yourself with a towel when you use a sauna. You can even visit the sauna room naked. The less clothing you wear, the more you open your body up to as much of the heat as possible. And, the more you open your body to heat, the better the results. When using the sauna, you should initially start with a low heat setting. You can slowly increase the heat setting after getting more comfortable. However, you shouldn´t stay in the sauna room for more than 20 minutes at a time. It is imperative for you to drink plenty of water before and after a sauna session. Saunas can cause fluid loss. You wouldn´t want to become dehydrated when trying to lose weight in a sauna session. Of course, you won´t be able to achieve desirable results with sauna treatment alone. You must also concentrate on eating a light diet. If you want to lose five pounds, you will need to count your calorie intake as well. Hence, instead of feasting on fatty foods such as fried meals, sweets, chips, and fast food, you should focus on eating fruits, lean proteins, vegetables, whole grains, and low-fat dairy products. If you want to avoid adverse health effects, it is of paramount importance for you to take safety precautions before visiting the sauna room. You should avoid drinking alcohol at all costs before heading to the sauna room. It is because alcohol dramatically increases the risk of arrhythmia, dehydration, hypotension, and sudden death. It is also advisable for you to limit your stay in the sauna to 20 minutes at a time. Extended stays in the sauna room can be detrimental to your health. If you are a newbie, you shouldn´t spend more than 9 minutes in the sauna room. You can slowly increase the sauna time as you start getting used to the heat. It is also imperative for you to replace the fluids lost from sweating. Excessive sweating in the sauna room can lead to a loss of electrolytes, which can, in worst cases, lead to kidney damage or even death. In addition to that, the overexposure to hot conditions can also cause heatstroke or cardiovascular emergencies. And, you can only replace the lost fluids by staying hydrated. Hence, you should drink plenty of water after a sauna session. You shouldn´t visit the sauna when you are sick either. You should wait until you recover before you use it.